Partly based on and modified from the entry “Onverwacht Group” in the Encyclopedia of Astrobiology” (Springer, 2015) by Gary. R. Byerly and on the review article “Geologic Evolution of the Barberton Greenstone Belt - A Unique Record of Crustal Development, Surface Processes, and Early Life 3.55-3.20 Ga” by Gary R. Byerly, Donald R. Lowe and Christoph Heubeck (in: Van Kranendonk, M.J., Bennett, V.C., and Hoffmann, J.E., Earth’s Oldest Rocks – Second Edition. Elsevier (Amsterdam), 569-613). The Komati, Hooggenoeg and Kromberg Formations are part of the Onverwacht Group, the lowermost major stratigraphic unit of the Barberton Greenstone Belt (BGB) in South Africa and Swaziland. In the Songimvelo Block (Byerly et al. 2018) in the southwestern part of the BGB, the six formations of the Onverwacht Group are divided by the Komati Shear Zone (KSZ): The upper four formations, of which three constitute the topic of this article, are at greenschist-facies-metamorphic grade; the lower two formations, south of the KSZ, at amphibolite-grade. The Onverwacht Group consists predominantly of ultramafic and mafic volcanic rocks with comparatively minor components of chemical and siliciclastic rocks. It shows a prolonged and complex tectonic evolution spanning almost 300 Ma (ca. 3550 – ca. 3260 Ma). Within this enormous time period, the thick, mostly volcanic Komati, Hooggenoeg and Kromberg Formations each formed within comparatively short time periods (a few Ma) which qualifies them as representing individual major volcanic episodes. If they were representative of Archean magmatism ca. 3.4 Ga ago, these units could represent a Large Igneous Province (LIP). The (from base to top) Komati, Hooggenoeg and Kromberg Formations reach ca. 9 km thick in composite section and range in age from about 3,490 to about 3,334 Ma (Byerly et al. 2018). Some of the best sections lie on the northern limb of the Onverwacht anticline; most strata are subvertical but strain is very low to nil. Lowe et al. (2012) provide a detailed map, revised stratigraphic nomenclature, and structural cross sections of the central greenstone belt (Fig. 1). Fig. 1. Geologic overview map of the Barberton Greenstone Belt and stratigraphic columns of the Onverwacht Group on the west limb of the vertically plunging Onverwacht Anticline between the Komati Fault Tons (KFZ) and the Granville Grove Fault (GGF). KF = Kromberg Fault. On that limb, the Onverwacht Group reaches ca 9 km stratigraphic thickness. Stratigraphic column from Byerly et al. (2018). Byerly et al. (2018) describes in detail the stratigraphy of the Komati, Hooggenoeg and Kromberg Formations. The following paragraphs summarize this description. De Wit and others (2011) offer a number of opposing perspectives on the geology of the Onverwacht Group and its formations. The Komati Formation (Viljoen and Viljoen, 1969a) reaches about 3500 m in its type section on the west limb of the Onverwacht Anticline. It is composed almost exclusively of komatiitic and subordinate basaltic volcanic rocks (Viljoen and Viljoen, 1969a; Arndt et al., 2008; Dann, 2000), contains no chert units and only a single thin dacitic ash bed, dated by Dann (2000) to be 3,481 +- 2 Ma old. The contact to the underlying Theespruit Formation is everywhere represented by the Komati Shear Zone (Kisters et al. 2003, 2010); the formation is overlain by the Middle Marker, a chert marking the base of the Hooggenoeg Formation. Although de Wit et al. (1987a) suggested that the layered komatiites are vertical dikes within a sheeted dike complex and Grove et al. (1997) interpreted them as horizontal sills intruded into the deep Archean crust, most workers have supported their origin as ultramafic, high-magnesian lava flows (e.g., Cloete, 1999; Dann, 2000). Komatiites are composed of high-magnesian olivine, pyroxene, and chromite set in a fine-grained matrix that was probably glass. Olivine and pyroxene in komatiitic flow units commonly display spinifex textures, large skeletal and dendritic crystal fabrics of olivine or pyroxene (now completely altered to amphibole, chlorite, carbonate) that grew downward into the flow from a “roof” of the upper chilled crust. They were first interpreted as "crystalline quench texture" by Viljoen and Viljoen (1969b) who noted that their morphology of the dominant minerals resembled those of crystals growing when molten olivine basalt cools rapidly. Nesbitt (1971, 1982) formally introduced the term spinifex for different types of skeletal crystals in komatiites from Australia and Canada (Fig. 2). Fig. 2. Large, downward-radiating spinifex textures in komatiitic flow of the Komati Formation, Farm Avontuur. Stratigraphic-up is to the left. Pillows are usually poorly developed but do occur in komatiitic basalts of the Komati Formation. Chromites are both morphologically and compositionally commonly preserved, even in the most altered rocks, but primary olivine and pyroxene is not. Robin-Popieul et al. (2012) and Puchtel et al. (2013) conclude, based on new analytical data on major, trace, and isotopic compositions of these komatiites, that the lavas of the Komati Formation originate from a dry plume. Their study demonstrates the importance of early Earth fractionation. 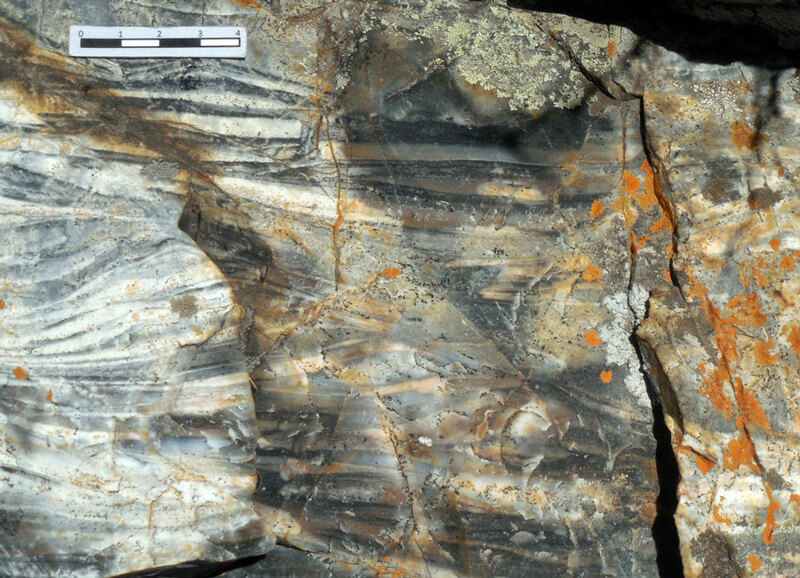 Notably, the Komati Formation contains only one known sedimentary layer, a 5-10 cm thick felsic tuff and, except at the top, lacks alteration zones that might represent breaks in the eruptive sequence. Their absence probably reflects the short time required for eruption of this thick unit. The 3472-3435 Ma Hooggenoeg Formation (Viljoen and Viljoen, 1969a), about 2 km in thickness, is dominated by basalt and basaltic komatiite but contains five major chert units and is capped by a thick pile of dacitic volcanics of ca. 3,445 Ma age. The formation comprises a thick sequence of tholeiitic basalts, komatiitic basalts and rarer peridotitic komatiites, dacitic igneous rocks, and thin cherty units. It reaches about 3900 m thick on the central part of the west limb of the Onverwacht Anticline and ca. 2900 m thick on the east limb. 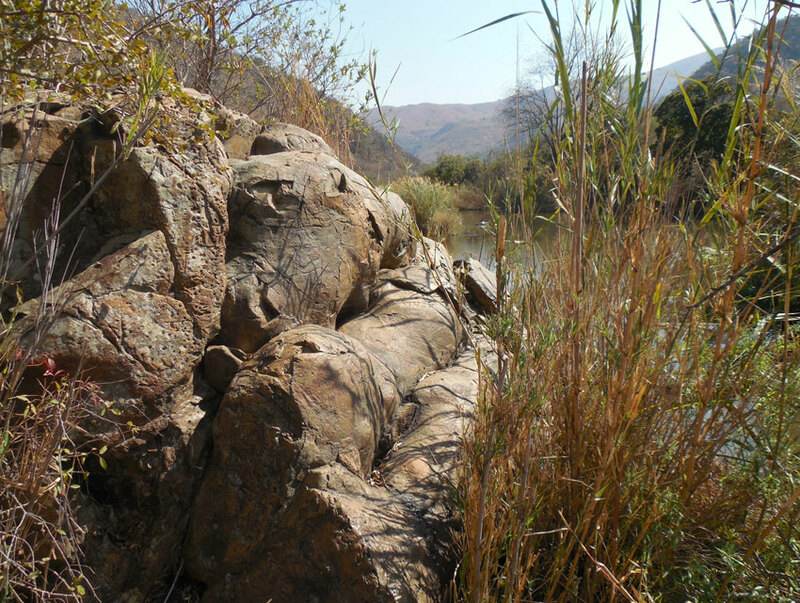 The upper (felsic) part of the formation is well exposed along the Komati River (Viljoen and Viljoen, 1969a; Lowe and Knauth, 1977). The Hooggenoeg Formation has been divided into six informal members (Byerly et al., 2018). Within each member, the volcanic units and capping cherts are designated with “v” and “c,” respectively (e.g., H2v and H2c): (H1) the Middle Marker; (H2) massive and pillowed tholeiitic basalt capped by a thin unit of gray chert; (H3 and H4) units of komatiitic basalt and basalt with at least two zones of spinifex-bearing komatiite at the top of H2v and in the lower third of H3v, capped by thin units composed largely of silicified volcaniclastic debris (H3c and H4c); (H5) basalt and variolitic basalt capped by a thin unit of gray chert and silicified volcaniclastic sediment; and (H6) felsic volcanic and volcaniclastic rocks. Each member and the component volcanic and cherty divisions are traceable around the entire Onverwacht anticline and Kromberg Syncline. Evidently, the rapid eruption of mafic to komatiitic volcanic rocks formed extensive, low-relief subaqueous volcanic plains that were mantled by thin veneers of volcaniclastic and carbonaceous sediments during regional breaks in eruptive activity (Figs. 3, 4). Fig. 3. Third chert unit of the Hooggenoeg Formation (H3c) on the west limb of the Onverwacht anticline, Hooggenoeg Creek section. This unit can be followed for ca. 40 km along strike. Unit is overturned; stratigraphic-up is to the right. The flow-top alteration breccias, early silicified and reworked ash-fall tuffs and volcaniclastic sedimentary rocks illustrate numerous surface processes on the early earth. Figure 4: Uppermost part of H3c, immediately underlying H3c. 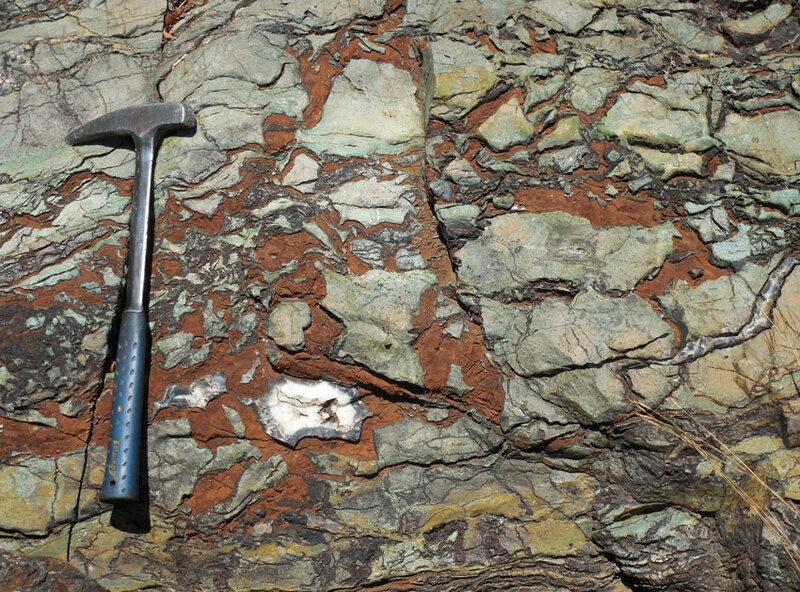 The pillow lavas of the uppermost 20-50 m of this unit, below H3c (previous figure) are partially silicified. Beds dip steeply to the left; stratigraphic top is to the right. de Wit et al. (2011) and Furnes et al. (2011) present alternative interpretations of the geology of the Hooggenoeg Formation. In the Komati Gorge section, the 3435-3334 Ma Kromberg Fm. overlies silicified volcaniclastic turbidites and debris-flow deposits of H6 (the Noisy Formation of Grosch et al., 2011) at the top of the Hooggenoeg Formation Fig. 5). Fig. 5. Flame structure of fine-grained, laminated ash (light grey) dragged by high-density, coarse-grained turbiditic flow to the right and deformed by load structures as the grains settled. Stratigraphic top is up. 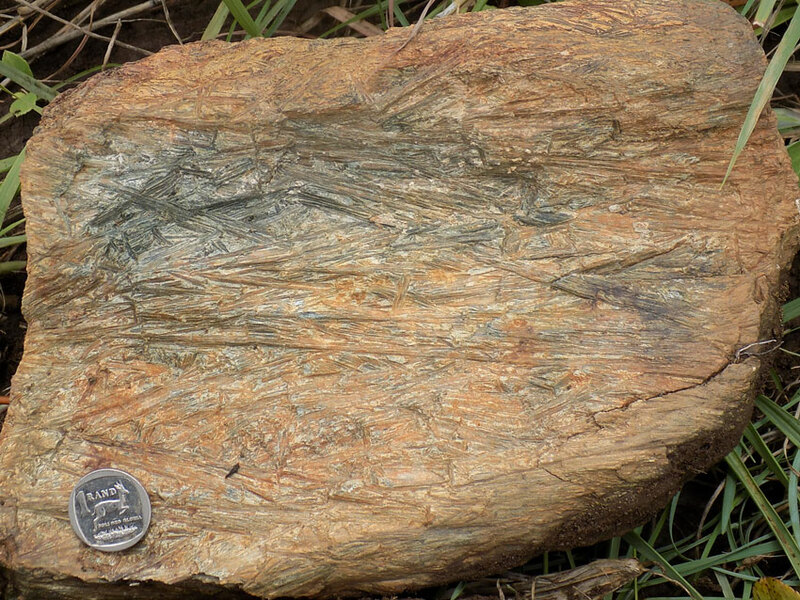 Unit H6 of the Hooggenoeg Formation (the Noisy Formation of Grosch et al., 2011), exposed in the Komati Gorge section. At this locality, 100-200 m of massive serpentinized ultramafic rock marks the base of the type section of the Kromberg Formation (Viljoen and Viljoen, 1969a). They are overlain by about 1700 m of volcanic and sedimentary rocks representing three principal lithofacies: (1) massive and pillowed basalt and komatiite; (2) mafic lapilli tuff and lapillistone; and (3) black and banded chert (Figs. 6, 7). Fig. 6. 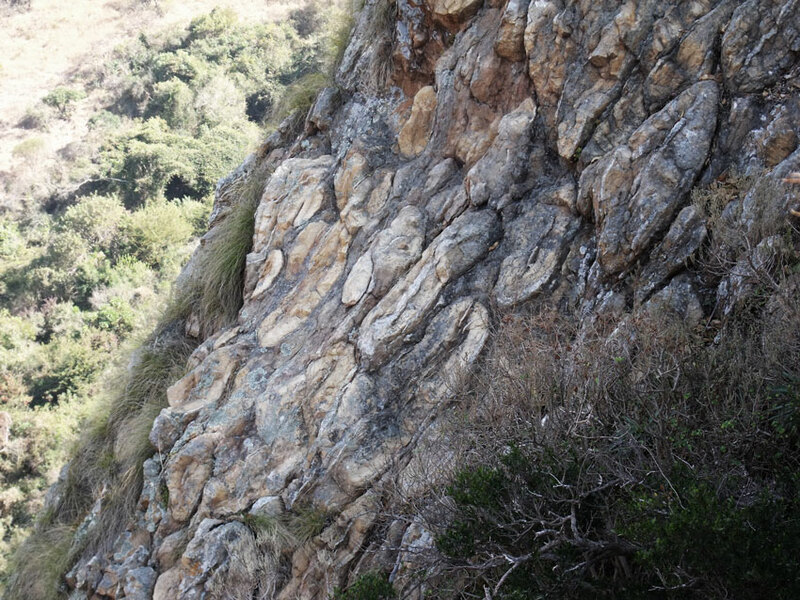 Well-exposed tholeiitic pillow basalt of the Kromberg Formation, about 500 m above the base of the formation in Komati Gorge section. Fig. 7. Zone of quartz-carbonate-fuchsite rock near the top of the Kromberg formation, Komati Gorge section. Green rock is silicified ultramafic rock green in color due to fine-grained Cr-rich sericite; brown rock is Fe-rich carbonate. Note white silica-filled cavity. Lower and Byerly (2003) interpret this rock as a low-temperature flow-top hydrothermal alteration zone; de Wit et al. (1982) as a mylonitic gneiss representing a major thrust fault. Along the west limb of the Onverwacht Anticline, the Kromberg Formation has a basal member (K1c, Buck Reef Chert) of silicified volcaniclastics and carbonaceous and ferrigenous banded cherts, up to 400 m thick. This unit, drilled by the BARB-3 well, contain what is arguably the best evidence for life in the Onverwacht Group. Diagenesis, Archean weathering, metamorphism, metasomatism, and modern weathering have significantly modified the original igneous and sedimentary rocks of the Onverwacht Group. Metamorphism in the Komati, Hooggenoeg and Kromberg Formations in the Songimvelo Block is rather uniform at lower greenschist facies (Xie et al. 1997). There is nearly ubiquitous very early diagenetic or metasomatic silicification of sediment, including carbonaceous matter, volcanic ash, ferrigenous matter, and evaporitic material, giving rise to sometimes spectacularly preserved, highly diagnostic sedimentary structures and textures (Lowe, 1999; Lowe and Fischer Worrell, 1999; Hofmann and Bolhar, 2007). Komatiitic lavas are in places highly silicified, likely by processes similar to those that act on sediment and likely at the Archean seawater-rock interface (Hanor and Duchac 1990). Microfossils and microbial mats (Walsh 2010; hickman-Lewis et al. 2018) and organic matter (Tice and Lowe 2006) in sedimentary interbeds represent some of the most compelling evidence for early life on Earth. Stromatolites are found stratigraphically somewhat higher in the Mendon formation (Byerly et al. 1986). Microfossils include a variety of morphologies and sizes, suggesting a considerable diversity of early life in these early shallow-marine environments. Banerjee and others (2006) report the preservation of microbial textures and biomarkers in pillow lavas but Grosch and McLaughlin (2014) question their biogenicity. Recent studies have added isotopic and chemical analyses of individual microfossils (van Zuilen et al. 2007). Hickman-Lewis et al. (2018) provide a recent review. Komatiitic volcanism was first documented in the Onverwacht Group (Viljoen and Viljoen 1969a). The discovery section and type section (in the Komati Formation) lies just north of the Komati River. The Viljoen brothers studied both the lower and upper formations of the Onverwacht Group, but their work in demonstrating that komatiites represent lava flows is particularly important. Dann (2000) re-examined the Komati Formation, adding new detail to the volcanic architecture of this unit. Stiegler-Thompson et al. (2010) further documented the widespread distribution of explosive komatiitic volcanism in the Onverwacht Group. The origins of komatiites, and particularly those of the Onverwacht Group, are debated in a series of publications using a variety of mineralogical, isotopic, and chemical information to support a wet-low temperature-subduction origin versus a dry-high temperature-plume origin (Parman et al. 1997; Robin Popieul et al. 2012; Puchtel et al. 2013). Eight large asteroid impact layers have been found in the Onverwacht Group (Lowe et al. 2003, 2014). Cr-isotope evidence has provided strong confirmation of the impact hypothesis. Each of these impacts was likely larger that the K/T impact, and several were likely comparable to other late-heavy-bombardment impacts of the inner solar system that gave rise to the lunar maria. The impact layer in member H4c of the Hooggenoeg Formation, the S1 impact layer, has been dated at 3,472 Ma and correlated with an impact layer of the same age in the Pilbara region of western Australia (Byerly et al. 2002). 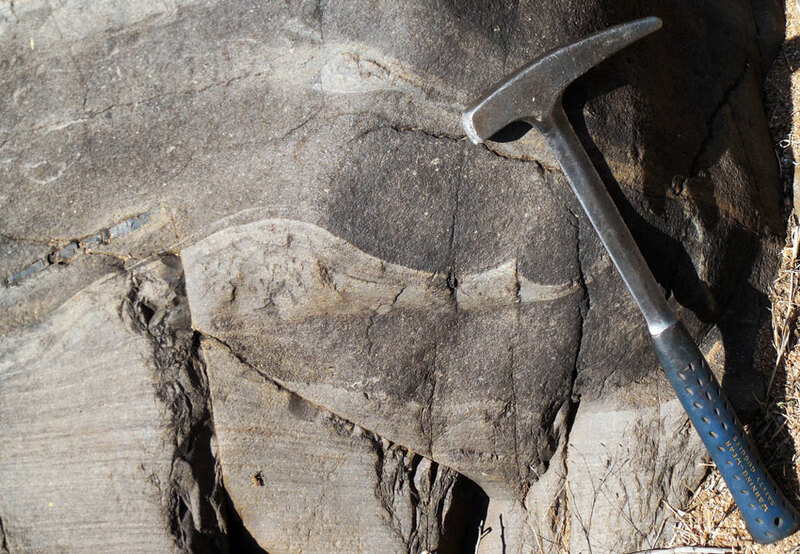 A new impact layer has been identified in the lower Kromberg Formation and two other impact layers in the Mendon Formation. Lowe and Byerly (2018) discuss the tectonic effects of large impacts. While the impacts recorded by spherule beds S1, S6, S7 and S8 did not appear to have substantially modified the tectonic or volcanic setting of the Onverwacht pile, the S2 (ca. 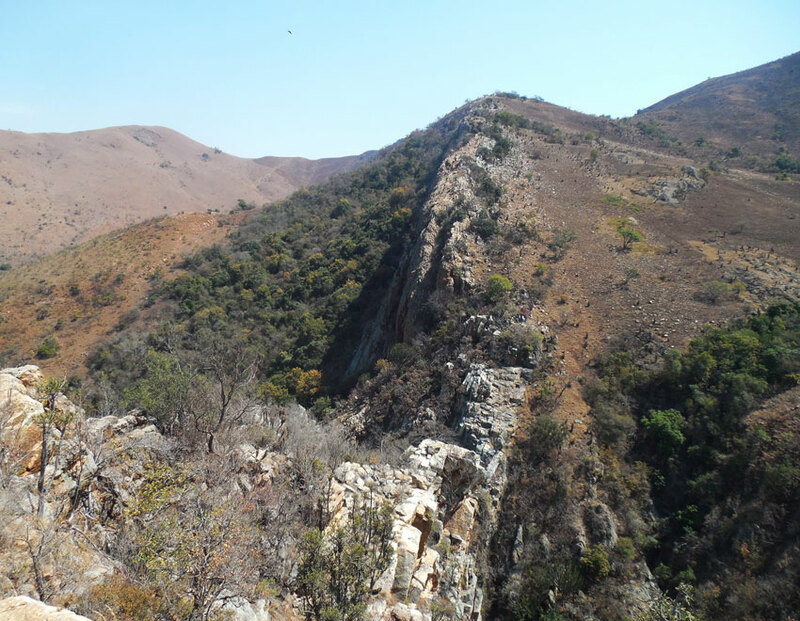 3260 Ma) and S3/S4 impacts (3,243 ± 4 Ma) near the Onverwacht – Fig Tree contact mark the transition from a volcanic anorogenic regime to an interval of deformation and uplift. Although these occurred at different times (but probably all within a 20–25-million year interval), these transitions were directly associated with a large asteroid impact each, suggesting that a series of large impacts or an impact cluster may have been responsible for disrupting the previously existing crust and geodynamic regime (see also Glikson 2001, 2008). Because the impactors were in all cases distant, no interactions with magmatic products has been doucumented. Surface environments have been constrained based on sedimentary chert and silicified volcaniclastic rocks (Tice and Lowe 2006). The lavas and sediments appear to have been deposited on a marine platform, with environments ranging from sub-wavebase to supratidal (Fig. 8). Figure 8: Climbing-ripple cross-laminated silicified volcaniclastic sandstone, part of the thick (up to 400m) Buck Reef chert (K1c), Kromberg formation. Associated evaporates, conglomerates, and microbial strata, all silicified, allow to reconstruct a gradually subsiding shallow-water volcanic platform, initially with lagoonal components (Tice and Lowe, 2006; Lowe and Fisher-Worrell, 1999). Explosive volcanism resulted in significant deposits of airborne and wind-transported materials. Except for the latest stage of the Hooggenoeg Formation, when a large dacitic volcanic center evolved, topographic relief was low and resulted in the widespread distribution of units with only minor changes in thickness. At the end of Hooggenoeg time, enough relief was present that turbidites and debris flows flanked, at least locally, the main volcanic center. Arndt, N.T., Barnes S.J., Lesher C.M. (2008) Komatiite. Cambridge University Press: Cambridge. Glikson, A.Y. (2008) Field evidence of eros-scale asteroids and impact-forcing of Precambrian geodynamic episodes, Kaapvaal (South Africa) and Pilbara (Western Australia) Cratons. Earth Planet. Sci. Lett. 267:558–570. Hickman-Lewis, K, Westall F, Cavalazzi B (2018) Traces of Early Life From the Barberton Greenstone Belt, South Africa; in: in: Van Kranendonk, M.J., Bennett, V.C., and Hoffmann, J.E., Earth’s Oldest Rocks – Second Edition. Elsevier (Amsterdam), 1029-1058. Hofmann, A., Bolhar, R. (2007) The origin of carbonaceous cherts in the Barberton greenstone belt and their significance for the study of early life in the mid-Archaean rocks: Astrobiology 7, 355-388. Kisters, A.F.M., Stevens, G., Dziggel, A., Armstrong, RA, 2003, Extensional detachment faulting and core-complex formation at the base of the Barberton greenstone belt: evidence for a 3.2 Ga orogenic collapse: Precambrian Research 127, p. 355-378. Kisters, A.F.M., R.W. Belcher, M. Pujol, and A. Dziggel, 2010, Continental growth and convergence-related arc plutonism in the Mesoarchaean: Evidence from the Barberton granitoid-greenstone terrain, South Africa: Precambrian Research 178, 15-26. Lowe, D.R. (1999) Petrology and sedimentology of cherts and related silicified sedimentary rocks in the Swaziland Supergroup. In Geological Society of America Special Paper 329: Geologic Evolution of the Barberton Greenstone Belt, South Africa, edited by D.R. Lowe and G.R. Byerly, Geological Society of America, Boulder, CO, pp. 83–114. Lowe, D.R., Byerly, G.R. (2003) Field guide to the geology of the 3.5-3.2 Ga Barberton Greenstone Belt, South Africa: Field Conference on Archean Surface Processes, 184p. Lowe, D.R., Byerly, G.R. (2018) The terrestrial record of Late Heavy Bombardment. New Astronomy Reviews 81:39-61. Lowe, D.R., Fisher Worrell, G. (1999). Sedimentology, mineralogy, and implications of silicified evaporites in the Kromberg Formation, Barberton Greenstone Belt, South Africa. In: Lowe, D.R. and Byerly, G.R. (eds. 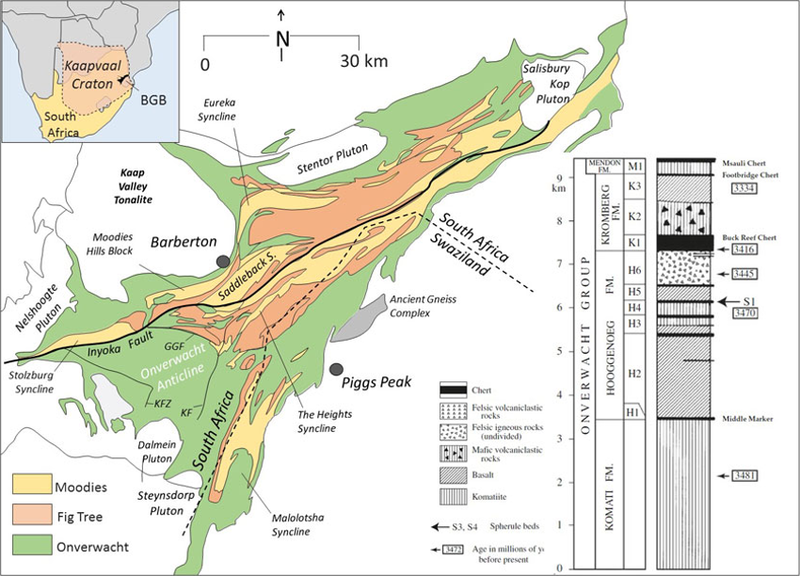 ), Geologic Evolution of the Barberton Greenstone Belt, South Africa. Special Paper, Geological Society of America 329, 167-188. Nesbitt, RW, Jahn B-M, Purvis AC (1982), Komatiites: An early precambrian phenomenon. Journal of volcanology and Geothermal Research, 14, 31-45. Nisbet, E.G. (1982) The tectonic setting and petrogenesis of komatiites. In: NT Arndt and EG Nisbet (eds.) Komatiites. pp. 501-520. George Allen and Unwin: London. Viljoen, M.J. and Viljoen, R.P (1969b), Evidence for the existence of a mobile extrusive peridotitic magma from the Komati Formation of the Onverwacht Group: Geol. Soc. South Africa, Spec. Publ. 2, 87-112.